I have enjoyed watching football for as long as I can remember. I went to a football college, live in a football town, and was even a sports reporter for a while. Did I also mention that I’m about as girly as they come? I love pink and bonus points if it sparkles. Glitter is my friend. The problem is that most of the time people view football as a man’s sport. Men play it and men watch it so obviously its marketed toward men. So where does that leave a football-loving girl such as myself? 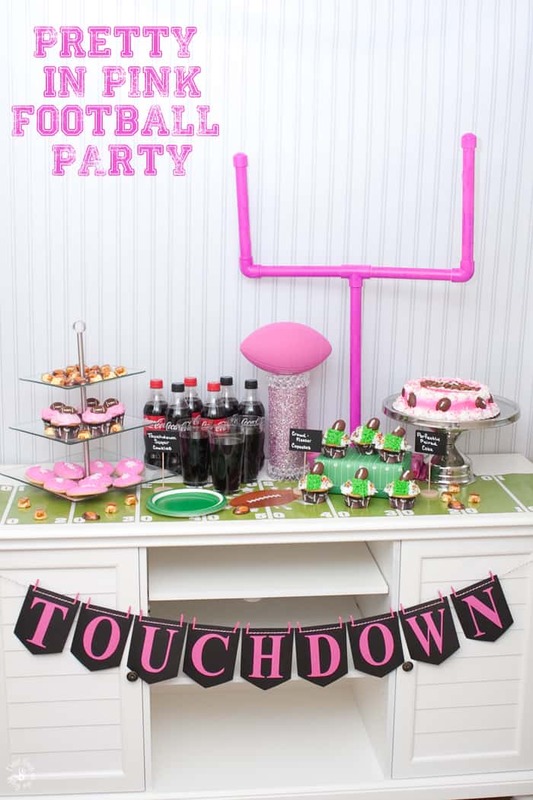 I figured that the big game could use a little sparkle (literally) so I came up with this Pretty in Pink Football Party. 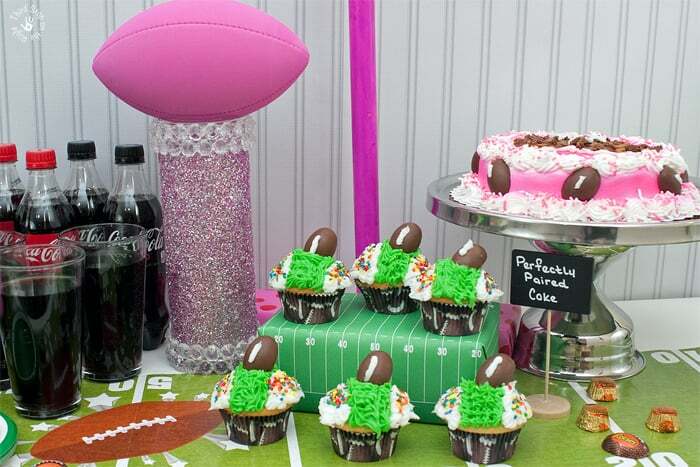 This party plan incorporates elements of a traditional football party, but with a feminine twist. I headed over to my local Target to not only get supplies, but also to get a little bit of inspiration. There, I was able to pick up not only ingredients to make the food, but also supplies such as decorations, drinks, and even necessities such as plates and napkins. I knew I wanted this Home Bowl (or homegate) to feature a dessert bar as opposed to the traditional bar foods and drinks. One of the things that I was particularly excited about that I found at Target were the football-shaped REESE’S Peanut Butter Cups. I just knew that in addition to being the perfect snack item, they would be perfect for decorating with too! 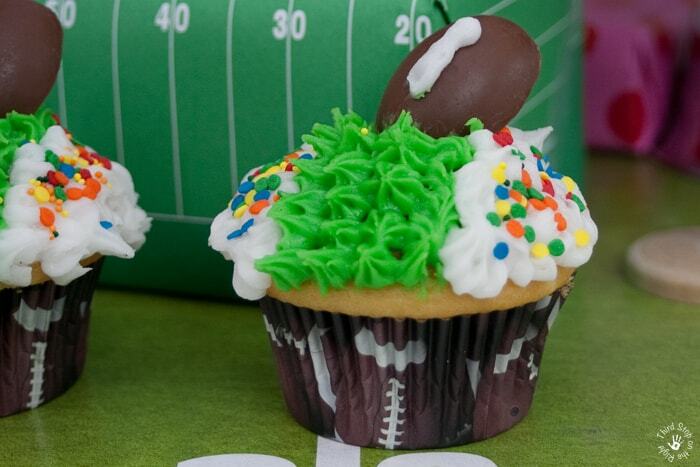 No dessert bar is complete without cupcakes, which is why I designed these “stadium” cupcakes. I made up a batch regular cupcakes in a football wrapper, and then I decorated the cupcakes white on each side with a green “field” down the middle. I then put some multicolored sprinkles on the sides to look like a crowd. I then topped it with one of the REESE’S cups in the shape of a football and put a small line of white icing down the middle so that it looked like the laces. 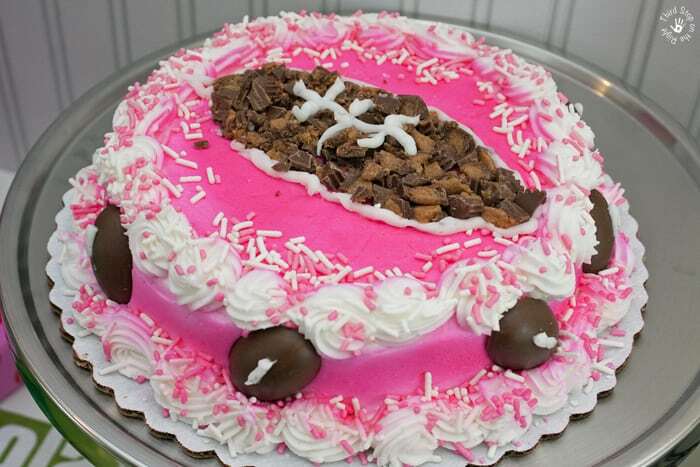 I also used the football REESE’s cups to decorate a white and pink football cake. I drew more of the white lines on the football REESE’S and stuck them to the sides of the cake. 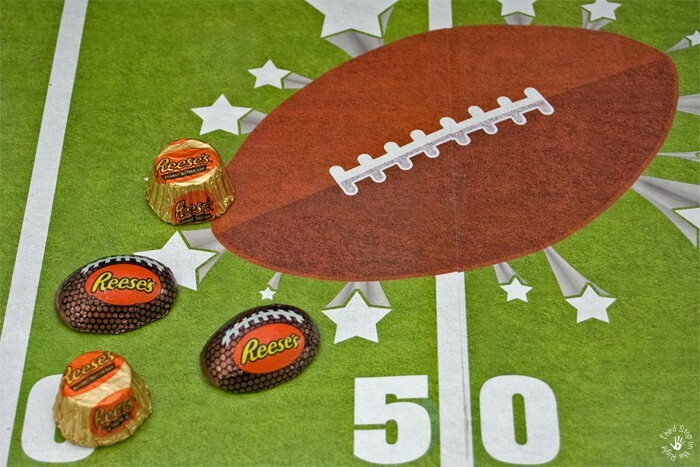 I then chopped up some of the REESE’S miniatures and arranged the pieces on the top of the cake to look like a football. 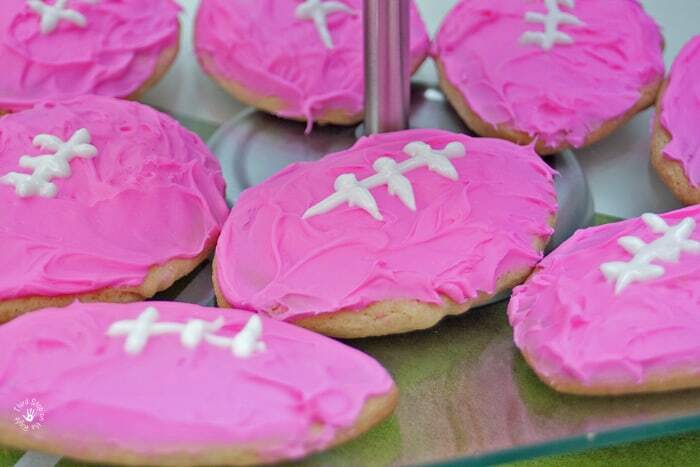 In keeping with my football dessert theme, I created some pink football-shaped sugar cookies. I was able to find a football cookie cutter and used that to make the shape of the cookies. I then iced them using some bright pink icing as well as an icing pen to create the white laces on the football. 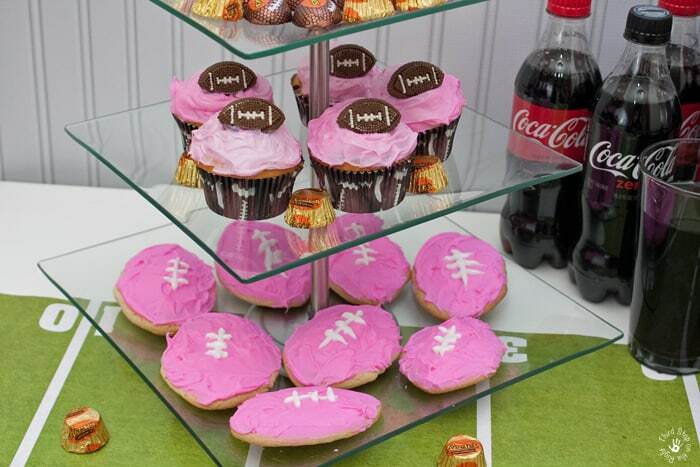 In addition to the cookies, I some pink football cupcakes. I decorated the cupcakes in the same bright pink icing I used for the cookies and then added a small football icing decoration to the top. Plus, I love that I was able to use the same cupcake wrappers that I used for the “stadium” cupcakes for these pink cupcakes as well. I interspersed some of the gold wrapper REESE’S cups among the cupcakes to fill in some of the extra space. 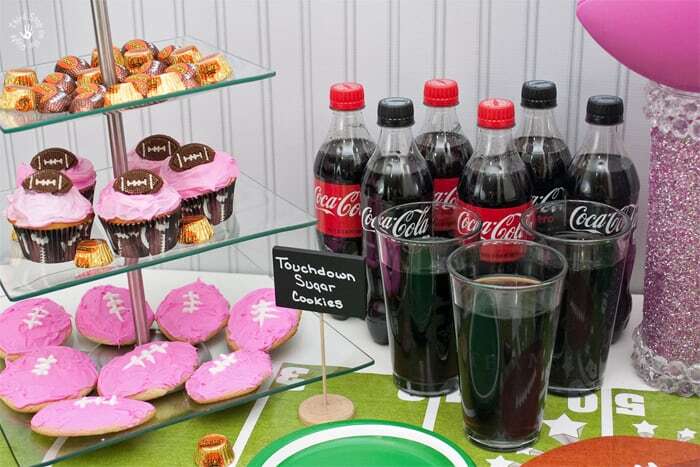 Another party must-have are bottles of Coca-Cola as well as Coke Zero. 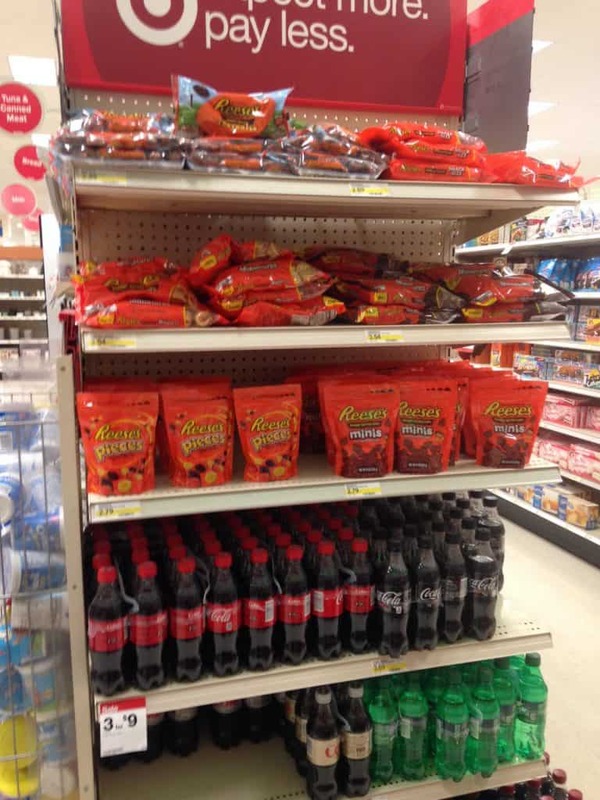 There is just something about REESE’S cups and Coca-Cola that is the perfect pairing. So, while I was at Target I picked up quite a few bottles of both Coca-Cola as well as Coke Zero. Everyone knows about writing your name on a disposable cup at a party so you know what drink it yours. Instead of using a marker to mark the cups, how about making personalized or unique drinking glasses for your guests that can be not only for drinks at the party but also a take-home item? I love this glass-etching technique to decorate cups. Plus, it is really easy to do. As I already said, this process is way easier than it looks. All you will need is a glass drinking glass, etching cream, stencils and a paintbrush. The best kind of stencils to use are the reusable adhesive kind which you can put on and peel off. 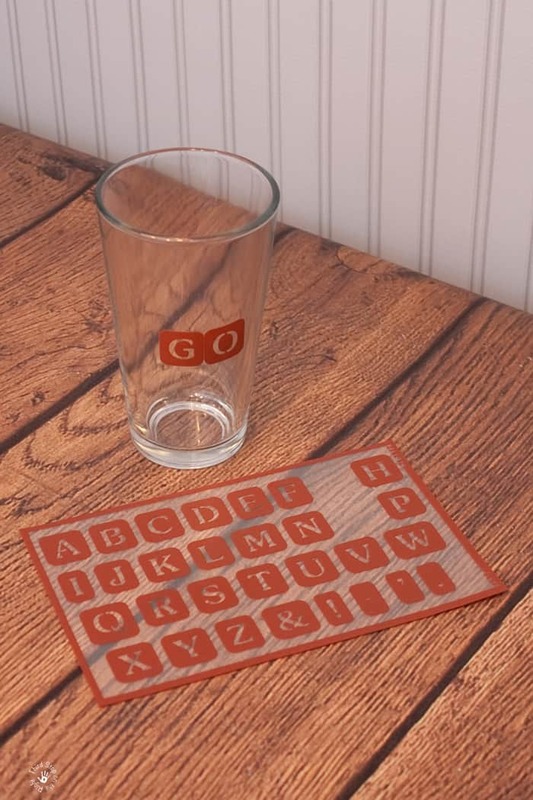 For this glass, I used some alphabet stencils so I could spell out some phrases, but you can also find patterns and even stencils of objects. 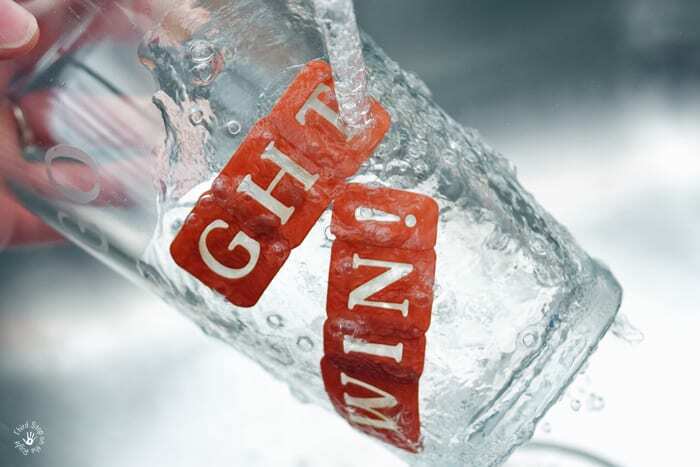 Place the stencils on the glass to spell out a phrase, name or anything else you would like to etch onto the glass. Next you will want to work a thick layer of the etching cream onto the stencils. Make sure to stay on the vinyl part so that you don’t etch somewhere you don’t want to. You will want to be sure to put the cream on thick so that it etches dark enough to be seen once you remove the stencils. After applying the etching cream you will want to let the glass sit for at least 15 minutes. After that, you can simply rinse of the etching cream in the sink with warm water. Make sure that you remove all of the cream. After you have rinsed off all of the cream you can then remove the stencils. 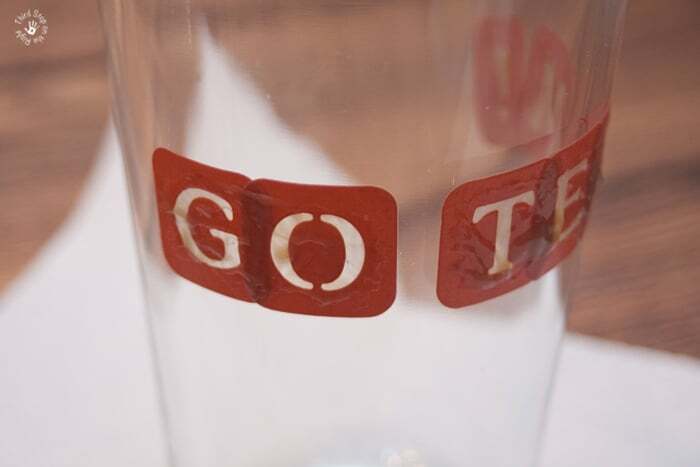 Now you have a unique, personalized glass for your guests! 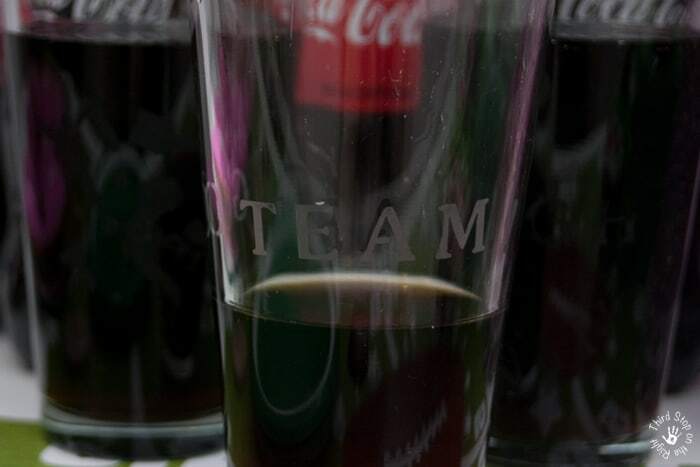 Just pour come of the Coca-Cola into the glasses and you are good to go! I was also able to pick up some great essentials to decorate for the party at Target. In particular, I found a banner kit and some chalkboard place markers. I used the place markers to label what the desserts were. I also used the banner kit to make a banner for the dessert table. The kit came with the black banner flags and I purchased some additional pink bakers twine and pink mini clothespins. I then used my die cut machine to cut out the letters for “TOUCHDOWN” and attached the letters to the flags. It was the perfect touch to the front of the table. 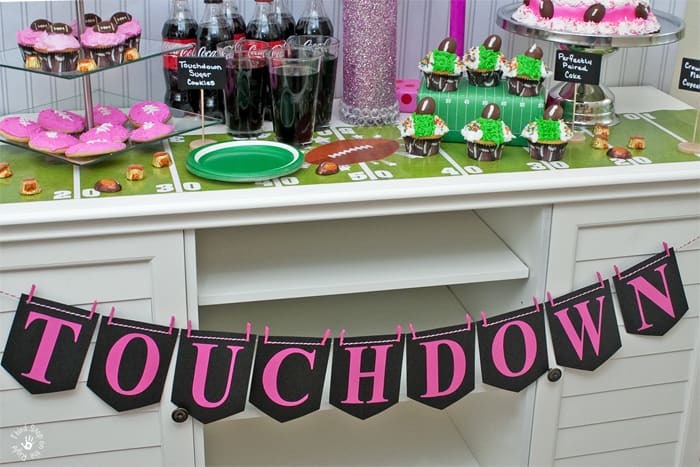 Two of the decorations I am most excited about, however, are the pink goal post and the pink, sparkly football trophy. Both were so easy to make too. The goal posts are actually pieces of PVC pipe which I pieced together and spray painted a bright pink. The trophy is a tall cylindrical vase which I glued glass gems to and then added glitter. I placed a pink football on the top to give it the look of a trophy. This party was so much fun to create. It would be perfect for planning a Girls Night Out to watch the big game, or just to bring a bit of femininity to your traditional football party. Plus, you can pick up everything you need at your local Target store. To make your shopping a little easier, be sure to take advantage of the Target Cartwheel offer to save 15% on both Hershey’s products as well as 6-pack (500 ml) Coca-Cola products. 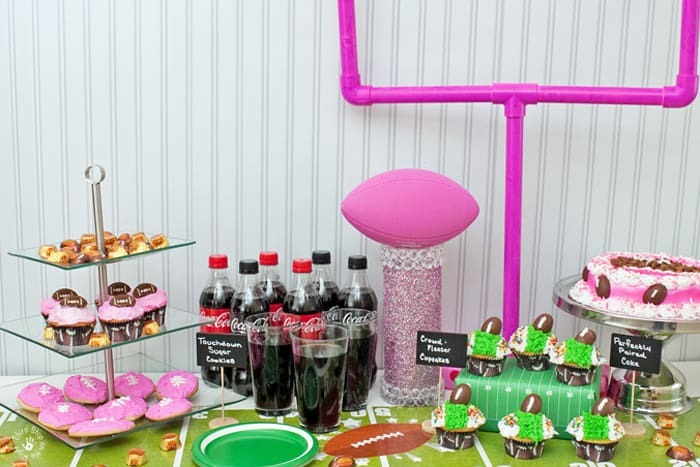 Comment On: What is your favorite part of of my Pretty in Pink Football Party? I love this! 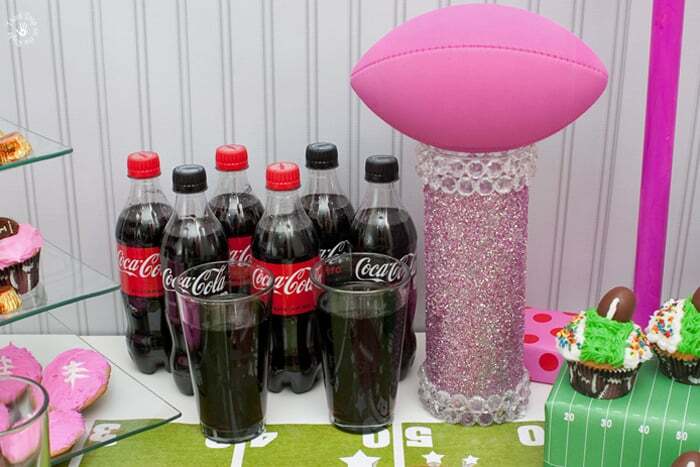 I’m totally a football loving, girly-girl who loves sparkles, too, so this party is right up my alley! 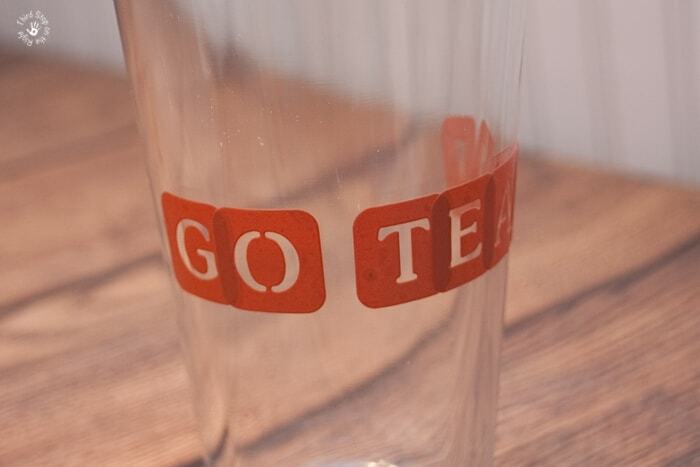 I never knew you could etch glass like that, either, so all sorts of awesome things in this post! Where ever did you find that pink football???? I have been searching for one and cannot find one to save me. I was actually able to find it on Amazon. This is the one that I purchased: http://amzn.to/2nlCC17. Thanks for checking out my blog!